The perfect summer sipper is a tall glass of ice cold sangria. A cool combination of fresh summer fruits and red, white, rose or sparkling wine, sangria is a luscious, thirst-quenching backyard or picnic beverage. Here are three sweet sangria recipes to help you chill out a little in the heat of summer. Just about any summer fruit can be used to make sangria. Peaches work well as do oranges, berries, apricots or even grapes. Apples are fun to include when it gets closer to the fall while mango and pineapples are perfect for adding a tasty tropical twist. As a rule, you want to use juicier fruits that will release their juices into the sangria and also be able to soak up the flavor of the wine. Even winter fruit can be used for a nice warm winter sangria. Once the fruit is soaked, you can keep it in the liquid for garnish and then enjoy eating it as a delicious dessert. Any wine can be featured in a sangria. Though red is traditional, experiment with white wine or even rose. You can even take sangria to an elegant level and use champagne or sparkling wine. Brandy is often added to sangria and, for a bubbly treat, you can top off sangria with ginger ale, seltzer or club soda. Combine wine, sugar and brandy in a large pitcher and stir well to dissolve sugar. 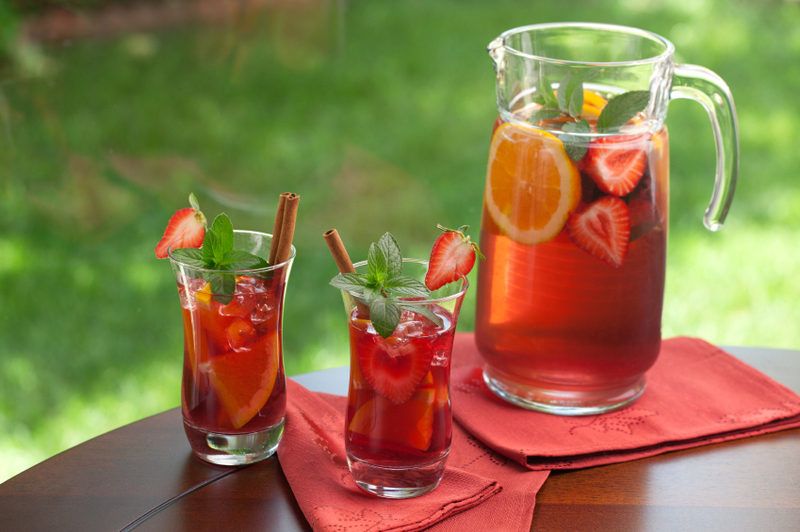 Add fruit and cinnamon sticks to the pitcher, stir, and let soak in refrigerator for at least 1 hour or overnight. When ready to serve, serve ice cold topped with club soda. Muddle basil leaves with sugar in a small pot. Add half the peach nectar and bring to a simmer. Stir and simmer until sugar is dissolved. Remove pot from heat and let sit until cool. Strain mixture through a fine colander into a pitcher. Add brandy, wine, peach and peach nectar. Stir well and let soak in refrigerator for at least 1 hour or overnight. When ready to serve, garnish with extra basil leaves. Combine orange liqueur, strawberries, blackberries and raspberries in a pitcher. Pour champagne into pitcher and stir well. Add grapes and serve right away.